Manufactured By – Zomba Records (Canada) Inc. Distributed By – BMG Canada Inc. Produced For – WaJeRo Entertainment, Inc.
Track 1 published by Tenman Tunes (adm. by Zomba Enterprises Inc.) / EMI April Music, Inc. o/b/o itself and Chase Chad Music (ASCAP) / EMI Blackwood Music, Inc. o/b/o itself and Waters Of Nazareth (BMI). Recorded at Right Track, NYC; Battery Studios, NYC and WIRE Studios, Orlando, FL. Mixed at Brandon's Way Recording, Los Angeles, CA. Pharrell Williams of N.E.R.D. appears courtesy of Virgin Records America, Inc.
Track 2 published by Tenman Tunes (adm. by Zomba Enterprises Inc.) / EMI April Music, Inc. o/b/o itself and Chase Chad Music (ASCAP) / EMI Blackwood Music, Inc. o/b/o itself and Waters Of Nazareth (BMI). Additional vocals recorded at Right Track Recording, NYC. Mixed at Windmark Studios, Virginia Beach, VA. Pharrell Williams of N.E.R.D. appears courtesy of Virgin Records America, Inc. Nelly appears courtesy of Fo' Reel Entertainment / Universal Records. Track 3 published by Tenman Tunes (dam. by Zomba Enterprises Inc.) (ASCAP) / WaJeRo Sound (adm. by South Hudson Music) (BMI). Produced and arranged for Tenman Productions and for WaJeRo Entertainment, Inc. Recorded at Westlake Audio, Los Angeles, CA. Mix engineered at Riprock 'n' Alex G Studios, FL. Track 4 published by Tenman Tunes (adm. by Zomba Enterprises Inc.) (ASCAP) / WaJeRo Sound (adm. by South Hudson Music) (BMI). Produced and arranged for Tenman Productions and for WaJeRo Entertainment, Inc. Recorded at Westlake Audio, Los Angeles, CA. Mixed at Conway Recording Studios, Hollywood, CA. Strings recorded at Clinton Recording Studios, NYC. Spanish vocal recorded at Ultrasonic Studios, New Orleans, LA. Mixed at Battery Studios, NYC. Mastered at Battery Mastering, NYC. 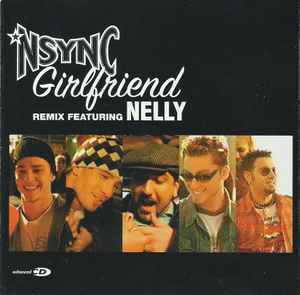 Album version of "Girlfriend" from *NSYNC's "Celebrity" (01241-44199-2/4) available on Jive discs & tapes. Look for *NYSNC's "PopOdyssey Live" (01241-44223-3-9). VHS available March 19, 2002 and DVD available April 9, 2002. ℗ 2002, 2001 & © 2002 Zomba Recording Corporation. Manufactured by Zomba Records (Canada) Inc. Distributed by / Distribué par BMG Canada Inc. Printed in Canada.